My 3rd great grandfather had at least two families. One of these families resided in Wilmington, NC while the other (the one I am descended from) lived in New Bern. From the evidence I've found so far, I believe he split his time between these two cities His occupation was listed as a cooper in a 1875 Wilmington City directory. This was a trade he probably had been doing for quite a long time. I think Bristow was probably doing this in 1865 when he leased land that was referred to as the Barrington estate. This leads to the answer to question one. 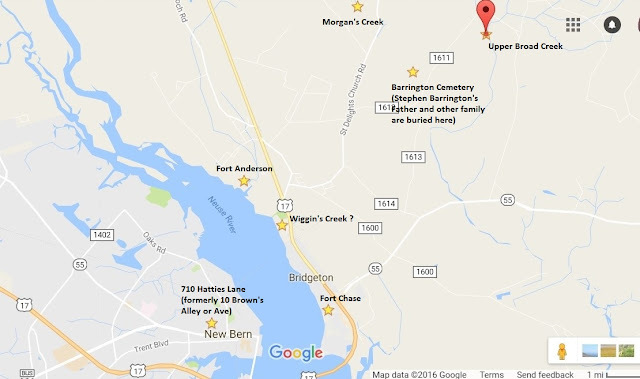 The land in question was located somewhere in an area in New Bern called Bridgeton. In 1865, long leaf pine trees covered the area surrounding New Bern. 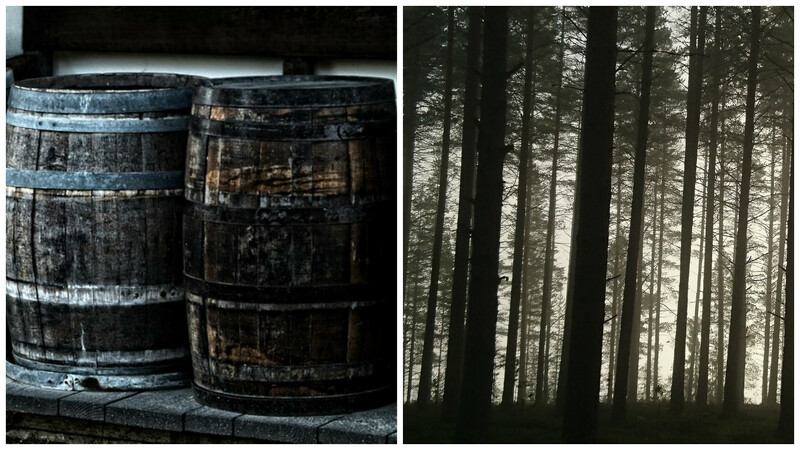 Tar, pitch and turpentine were products that were manufactured from long leaf pine. Someone whose occupation was making barrels probably had experience manufacturing turpentine and other naval store products. Bristow Harris would have resided close to resources that would have made it possible for him to earn a living. Did my 3rd great grandfather have a personal connection to Stephen Barrington? For now, I have not been able to identify one. I have however been able to get a better understanding of the general area Bristow worked based on information I've been able to dig up on the Barrington family thus far. I should start with noting that the land referred to as the Barrington Plantation was originally known as the Lincoln Plantation. Stephen Barrington (born abt. 1828) married Elizabeth Lincoln (born abt. 1832), the daughter of James Foster Lincoln. Elizabeth Lincoln Barrington died after the birth of her son Walter Barrington. When James Foster Lincoln died he left land to his grandson Walter Barrington. Since Walter was a minor, his father Stephen Barrington, cared for his interests. FamilySearch (https://familysearch.org/ark:/61903/1:1:Q2Q1-GS46 : 1 September 2016), Brister Harris, 1865-1872. "Brister Harris has lease for as many trees as he can cut." "Jan 12 Brister Harris, Col, all the trees"
So there. Now that I've got that all out, I'll get back to the lease agreement. I've featured here pages from the Freedman's Bureau Land and Property Records that mentions my 3rd great grandfather Bristow Harris. His lease was described as follows, "a lease for as many trees as he can cut." 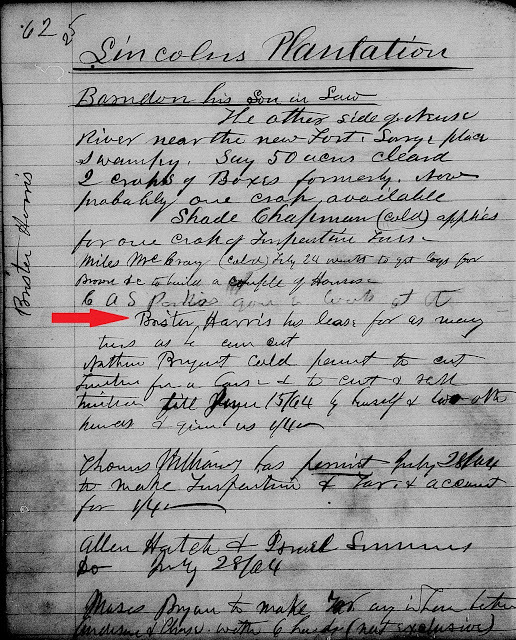 FamilySearch (https://familysearch.org/ark:/61903/1:1:Q2Q1-GW94 : 1 September 2016), Brister Harris, 1865. The U.S. Government needed resources for rebuilding after the Civil War and Brister Harris needed resources so he could provide for his two families as well as his workers. A "one equal fourth part of the production realized by the cultivation and working of the plantation" was to be delivered to the authorized Agent of the United States in Newberne" by January 1 1866. Sounds like Brister had a bit of an operation going on here. But where was he specifically working? Here are some clues I found in sections of his land lease that have helped me get a better sense of location. 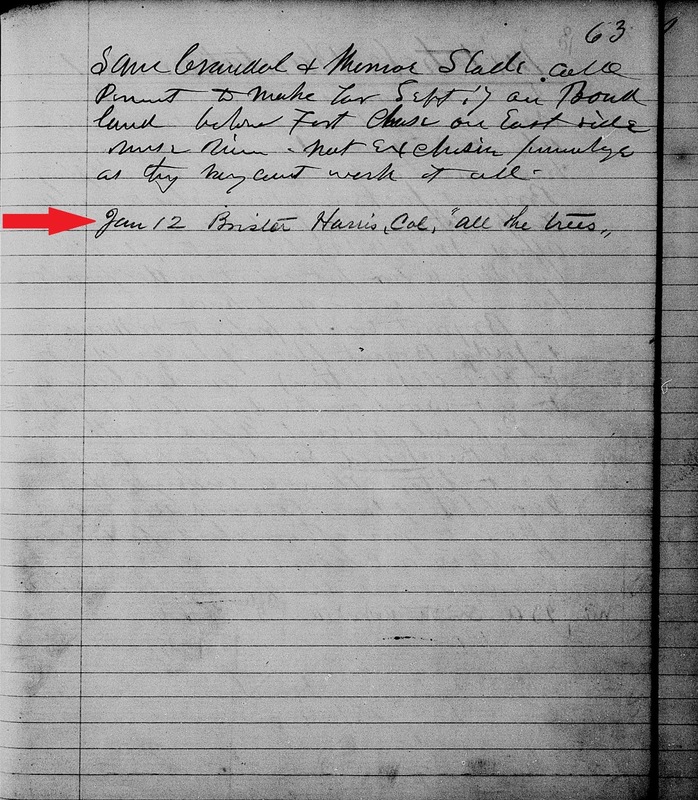 "North Carolina, Freedmen's Bureau Assistant Commissioner Records, 1862-1870," database with images, FamilySearch (https://familysearch.org/ark:/61903/1:1:V611-9WY : 12 December 2014), Brister Harris, 1862-1870; citing NARA microfilm publication M843 (Washington, D.C.: National Archives and Records Administration, n.d.); FHL microfilm 1,616,876. FamilySearch (https://familysearch.org/ark:/61903/1:1:Q2Q1-GQHZ : 1 September 2016), Brister Harris, 1865. 2) "...on the East side of the Neuse River and between the two forts." 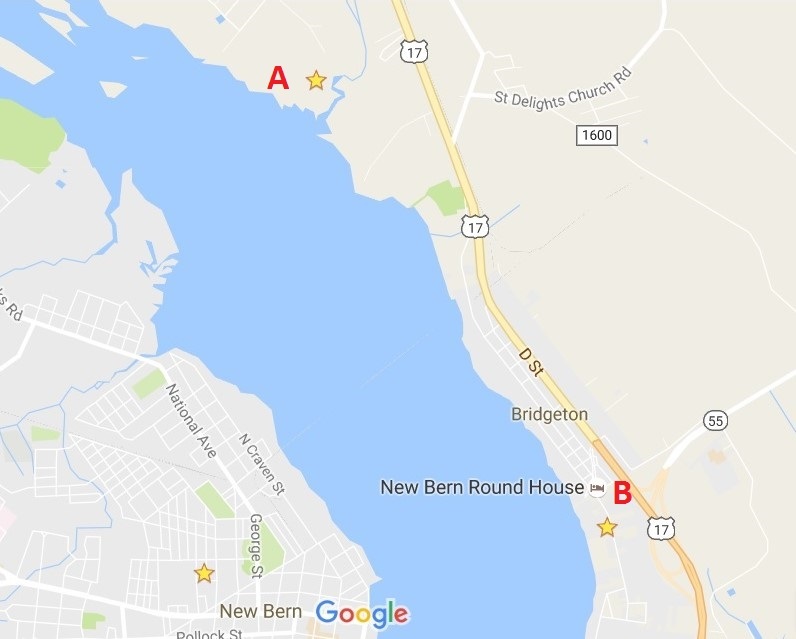 After doing a little research, I learned the names of two forts that existed on the east side of the Neuse River across from New Bern. I believe the forts mentioned in the Freedmen's record were Fort Anderson and Fort Chase. Point A: Approximate location of Fort Anderson. Point B: Approximate location of Fort Chase. 3) James Foster Lincoln was Stephen Barrington's father in law. When he died in 1854 he left half of his lands to Stephen Barrington's son. I found additional clues in Lincoln's estate record to give indication of the general area Bristow Harris may have worked. "North Carolina Estate Files, 1663-1979," database with images, FamilySearch (https://familysearch.org/ark:/61903/1:1:VKJM-J2R : 20 November 2015), James F Lincoln, 1854; citing Craven, North Carolina, United States, State Archives, Raleigh; FHL microfilm 1,845,546. I've been able to identify where Upper Broad Creek, Morgan's Swamp, Neuse River. In regards to Wiggins Creek, I'm still trying to figure out it's location. I pointed out a possibility on this map. I decided to plot on a map all these references to places just to see how things would look all laid out. I also, included the address 710 Hatties Lane. That's the address Bristow Harris's wife Amy Brown Harris resided at with her daughter Sarah J Harris and son in law Samuel Whitney in her later years. I like plotting things out on a map and having all these names of places noted in space. I know I will be referring back to this map as more details about Bristow Harris's life are revealed to me.